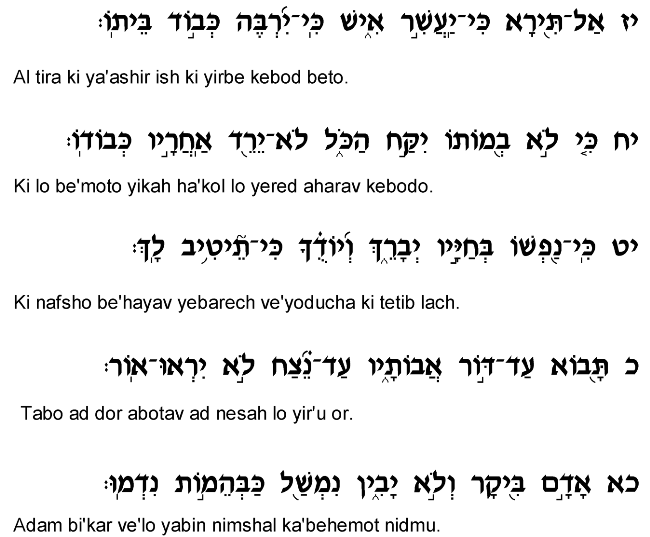 In stark contrast to the festive, triumphant tenor of the previous chapter, this Psalm ranks among the most somber and solemn passages throughout Tanach, as it addresses the theme of human mortality. It begins by emphasizing the relevance of this message to all people on earth, regardless of their pedigree or financial status (verses 2-3). The one thing that all human beings share is the eventuality of death, and the Psalmist therefore seeks to draw the attention of all men and convey to them his message. This Psalm then proceeds to ridicule those who derive confidence from wealth, who feel secure as a result of their fortunes. As the Psalmist notes, no sum of money in the world can be used to ransom one's soul from God. When the Almighty issues a decree, He will not accept a monetary bribe to suspend it. Furthermore, the Psalmist sarcastically asks, "Will he live for eternity, and never see the grave?" (verse 10). All men ultimately depart from this world and leave their wealth to others. As much as people try to assert their immortality by constructing buildings and giving them their names (verse 12), they eventually die and are forgotten like dead animals (verse 13). This message is perhaps most powerfully and succinctly captured in the famous pair of verses (17-18), "Fear not when a man accumulates wealth, when the honor of his household increases; for he will not take it all when he dies – his honor will not descend after him." 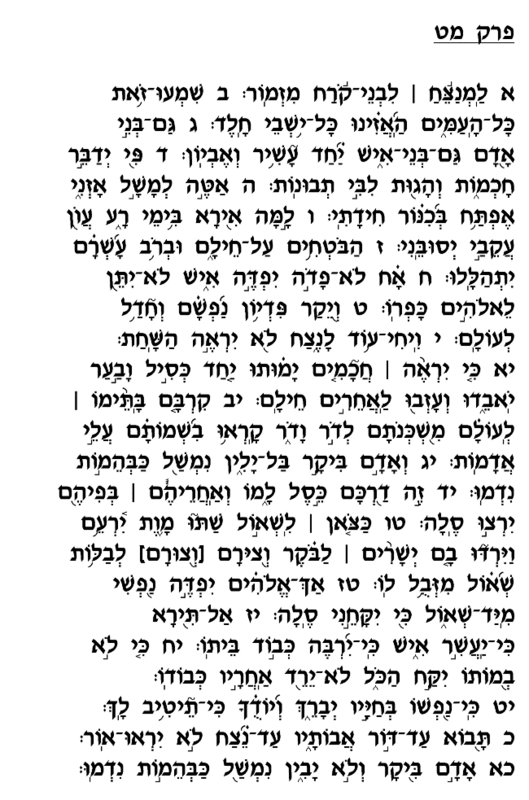 The theme of this chapter is eloquently expressed by Rabbi Yossi Ben Kisma, as recorded in Pirkei Avot (6:10): "At the time of a person's death he is accompanied by neither silver, gold, precious stones or jewels, but rather with only Torah and good deeds." It is foolish to devote one's life to the pursuit of wealth, which remains with him for such a short period, rather than exerting oneself in Torah study and Mitzvah performance, which stays with him for all eternity. 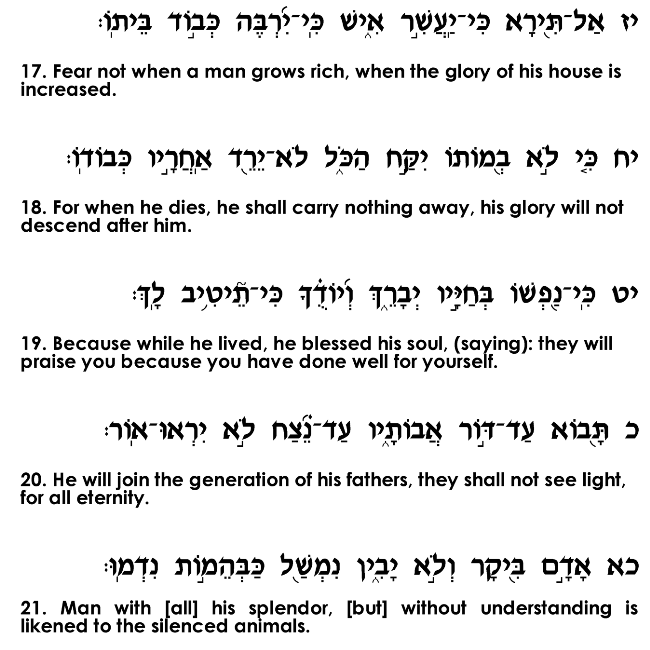 In some communities it is customary to recite this Psalm after the prayer service in a house of mourning. While the Mitzva of comforting mourners is intended primarily as an act of Hesed (kindness) towards the mourners, it also provides a certain perspective on life generally and the proper prioritization of the short amount of time we spend here on earth. The experience of visiting a mourner reminds a person of his own mortality and should thus inspire him to reconsider and reexamine his priorities in life. 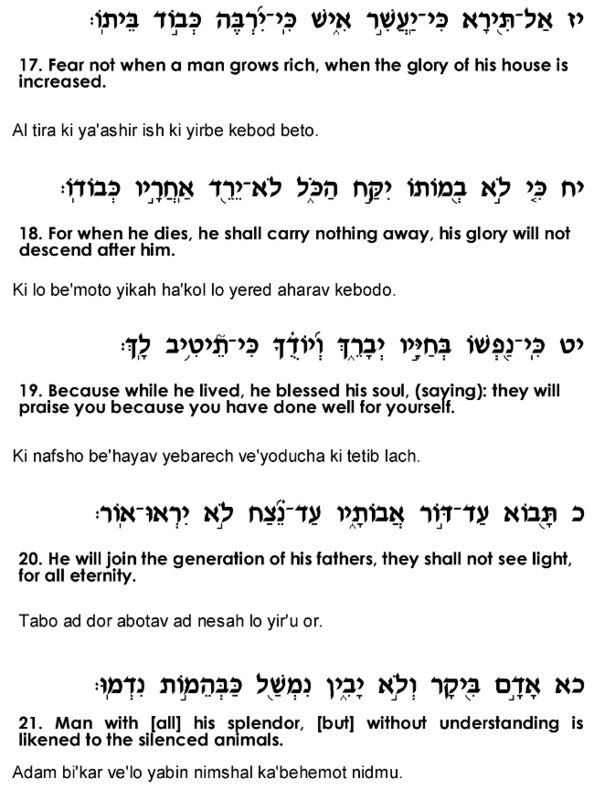 Appropriately, the custom developed to read this chapter of Tehillim, which very poignantly expresses the theme of mortality and the futility of the endless pursuit of wealth tragically consumes so many people.